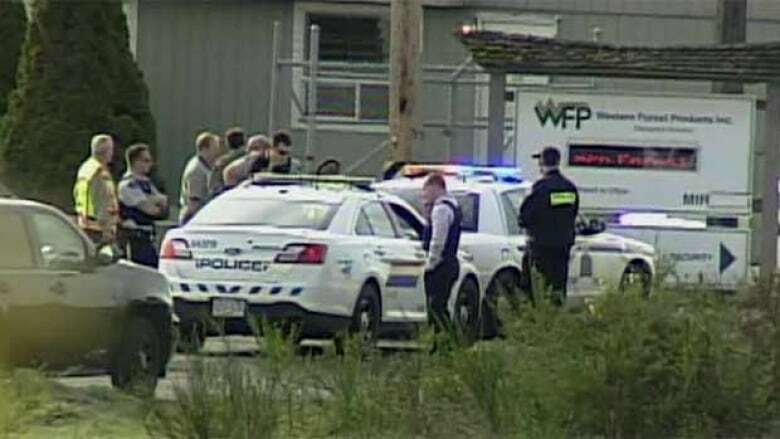 A former employee has been arrested after two people were shot and killed and two others were injured — including a company vice-president — at the Western Forest Products sawmill in Nanaimo, B.C., today. A former employee has been arrested after two people were shot and killed and two were injured at the Western Forest Products sawmill in Nanaimo, B.C., today. Family members have identified one of the dead as Mike Lunn, a father of three and grandfather to five. "He was a great guy," Linda Bledsoe, one of Lunn's seven sisters, told reporters outside the sawmill fence. "He was fun. He was very lovable, very jolly, and he loved his family very much," she said. "It's a shock to all of us because he's had a lot of great dreams. He's very family-oriented." 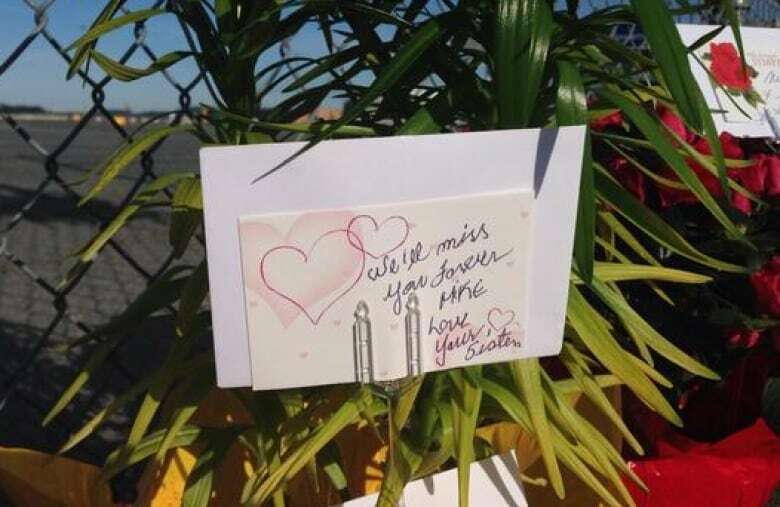 She said she was told her brother was shot as he arrived at work. "He had just gotten out of his truck, I guess," she said. RCMP officers took a 47-year-old Nanaimo man into custody shortly after the shootings. The president and CEO of the sawmill, Don Demens, confirmed the suspect formerly worked at the facility. Neither the RCMP nor Demens would speculate on the motive behind the shootings, which took place shortly after 7 a.m. PT in the parking lot and inside an office at the mill, which is in the industrial port area near downtown Nanaimo..
Al Thompson, a trucker who was picking up a trailer from the mill at about 6:45 a.m., said there were few cars in the parking lot and the mill was unusually quiet — it wasn't scheduled to ship any wood today. "There was hardly nobody here then," he told CBC News. "No employees had started or anything." He left with his trailer as the 7 a.m. start time for the workers approached, he said. "Ten minutes later, I hear this stuff going down," he said. "I just can't believe it. I mean, I know everybody in that damn mill." Sawmill worker Joe Kaila told CBC News he heard one of the shots, but didn't know what was going on at first. "All I heard was a big bang and that's it. I thought it was a barbecue tank that blew up or one of the gas tanks. That was it," he said. Officers were on the scene three minutes after receiving a 911 call, and a member of the emergency response team entered the sawmill and arrested the suspected shooter. Police said a shotgun was seized at the scene. After a sweep of the building for additional threats and injured victims, police said no other suspects were found. "I want to stress that at this time, we have no indication that there are any other suspects involved in this investigation," RCMP Supt. Mark Fisher said at a news conference earlier on Wednesday. Fisher said police are still investigating the incident and "reaching out to the families of those involved." He said there's additional forensic work to do at the scene and "that could take days, depending on the nature of the work." Fisher said that means the sawmill will be secured "for at least the next couple of days." Initially the RCMP would only confirm that four people were shot at the sawmill, but the B.C. Coroners Service later confirmed two people had died in the incident. "Following an incident at the mill in south Nanaimo shortly after 7 a.m. on April 30, 2014, two persons were transported by ambulance to Nanaimo Regional General Hospital. On arrival at hospital, both were pronounced deceased," said the statement by the B.C. Coroners Service. RCMP also later confirmed the deaths of two people, but refrained from naming them pending notification of next-of-kin. The identity of the second person who died has not yet been confirmed. "My sympathies, and that of all of us at the Nanaimo RCMP, go out to the families and loved ones of all the victims," Fisher said. "The families and mill employees will now have to cope with the tragedy that unfolded here today, as does the community of Nanaimo," Fisher continued. "It's going to be a challenge, but as detachment commander and a long-time resident of Vancouver Island, I can confirm that this type of extreme violence is extremely rare," he said. One of the two survivors of the shooting has been identified as Tony Sudar, the vice-president of manufacturing at Western Forest Products. Sudar's wife told reporters outside Nanaimo General Hospital that her husband had been shot in the face. She said he told her he felt that someone was behind him, and was shot when he turned around. She said Sudar was in stable condition. Demens added his condolences to the families, friends and coworkers "for those lives that were lost this morning, and those who've been wounded." "Our hearts and minds are certainly with them today," he said. According to Vancouver Island Health Authority, one person was airlifted to Victoria General Hospital in critical condition. One other person is in stable condition at Nanaimo General Hospital, according to spokeswoman Sarah Plank. Officials with Western Forest Products said all of their sawmills on Vancouver Island were closed for the day, after the shooting. Demens said the company is providing employees with grief counselling and support "wherever we can throughout the organization." Many local residents have reacted with shock and concern to the news. At the B.C. legislature, Premier Christy Clark said the people of British Columbia are standing with the victims, their families and others affected by the day's events. "This kind of tragedy is almost unknown in British Columbia," she said. "Most of us here today cannot imagine what the victims and their families must be going through. They should know they are not alone."